Two blasts targeting Coptic Christians in Egypt on Palm Sunday have killed at least 44 people, officials say. 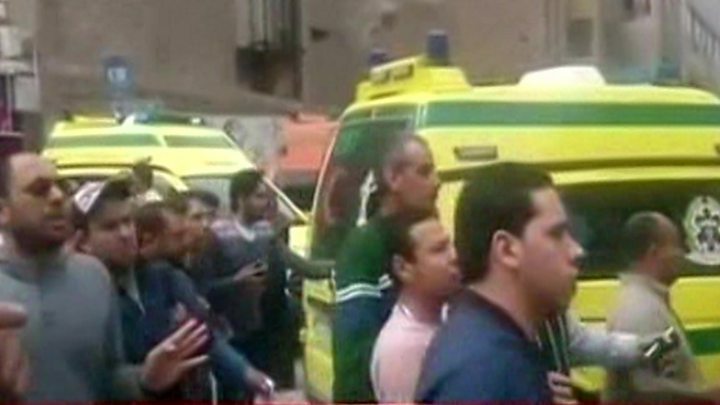 An explosion at St George's Coptic church in Tanta killed 27 people. Hours later, a blast outside St Mark's Coptic church in Alexandria left 17 dead. So-called Islamic State (IS) said it was behind the explosions, the latest in a series of attacks targeting the Christian minority in the country. President Abdul Fattah al-Sisi ordered military deployments across Egypt. In a statement, he said the army would be sent to protect "vital and important infrastructure". The government announced three days of mourning. Several police officers, including one policewoman, were among those killed, the interior ministry said. The suicide bomber blew himself up after they stopped him from entering the church. "I saw pieces of body parts and broken seats. There was so much blood everywhere, some people had half of their bodies missing. The first three rows [inside the church] were destroyed," Nabil Nader, an eyewitness, said. The explosions injured at least 71 people in Tanta and 35 others in Alexandria, the health ministry said. Egyptian security forces had been put on alert in anticipation of attacks. The attacks come weeks before an expected visit by Pope Francis intended to show support for the country's Christian minority. He condemned the explosions. "I pray for the dead and the injured, and I am close in spirit to the family members [of the victims] and to the entire community," the Pope said. The Copts are one of the most ancient Christian communities and the largest still left in the Middle East. But they have long felt vulnerable and marginalised. This sense of precariousness has only increased in recent years, with the rise of violent jihadism in parts of Egypt. The country's political and Muslim religious leaders have tried to provide reassurance that they stand united with the Copts - and have portrayed the recent upsurge in attacks as an attempt by extremists to sow division. But in recent months, Coptic families have been fleeing the northern Sinai after a series of murders and assaults. Their trust in the state's ability and willingness to protect them will now be even more deeply shaken - as bombs desecrate Palm Sunday, fulfilling a rash of recent threats by the Islamic State group to intensify their violence against Christians in Egypt. Pope Tawadros II told local TV that "sinful acts will not undermine the unity and coherence of the Egyptian people in the face of terrorism". In the UK, the General Bishop of the Coptic Orthodox Church, Bishop Angaelos, condemned the "senseless and heartless brutality" of the attacks. Meanwhile, US President Donald Trump said on Twitter that he had "great confidence" that President Sisi would handle the situation "properly". Violence against the religious minority has risen in recent years, especially since 2013, when the military overthrew President Mohammed Morsi, who hailed from the Muslim Brotherhood, and launched a crackdown against Islamists. Some Morsi supporters blamed Christians for supporting the overthrow. In February, IS warned of more attacks against Copts, who make up about 10% of Egypt's population. Copts believe that their Church dates back to around 50 AD, when the Apostle Mark is said to have visited Egypt. Mark is regarded as the first Pope of Alexandria - the head of their church. The early Church suffered persecution under the Roman Empire, and there were intermittent persecutions after Egypt became a Muslim country. Many believe that continues to this day.